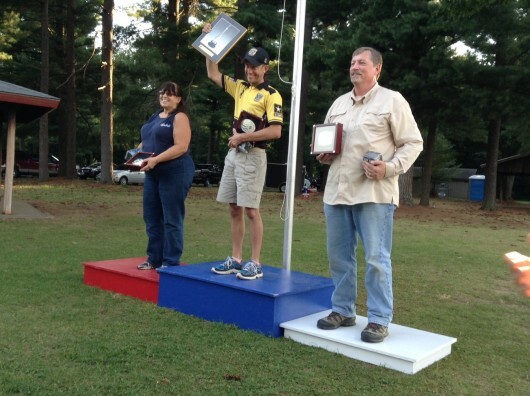 The 2015 Smallbore Championships closed out today with the Metric Any Sight Match. The conditions changed remarkably from metallic sights with a benign wind and comfortable temperatures. The Metric Champion was Hank Gray, from the AMU, who shot a 22347-126X. Nancy Tompkins 2342-115X was second and Allen Thomas, who posted a 2341-110X, was third. The Iron Man, William Marciniak, a junior from New Jersey, was presented The Lones Wigger Trophy for amazing the highest aggregate score over the four smallbore Championships. Gold, silver, and bronze winners: Hank Gray, Nancy Tompkins, and Allen Thomas. Just want to credit Joe Graf for the photos.